Combine all ingredients in a small bowl and blend well. Cover and chill in refrigerator until ready to use. This spread can be stored in your refrigerator for up to 2 days. 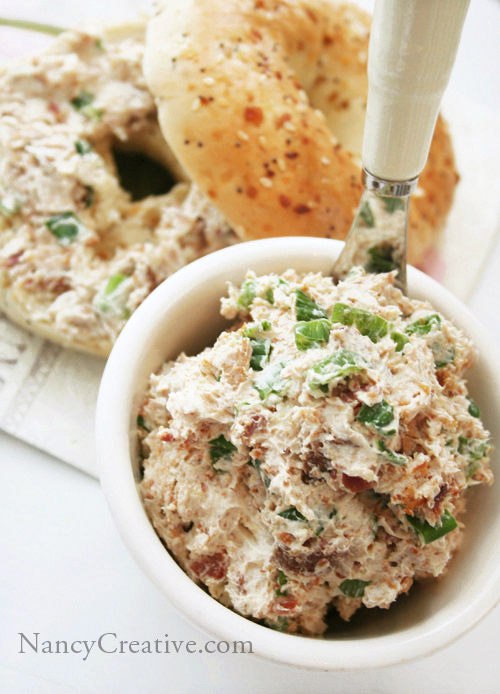 Serve as a spread for bagels or crackers. This entry was posted in Appetizers/Snacks, Breakfast/Brunch, Food and Recipes, Original Photography, Spreads and Dips and tagged appetizers, bacon, Bagel, breakfast, brunch, cream cheese, Everyday, recipe, Spreads and Fillings, Worcestershire Sauce on February 20, 2011 by nancyc. Those are great ideas, Jane–thanks for sharing them! I could spend hours here at your site looking at your yummy recipes! Love this one. This looks so good, I can smell it! I could comment on every post… you have some wonderful recipes (along with Isaiah). Oh! 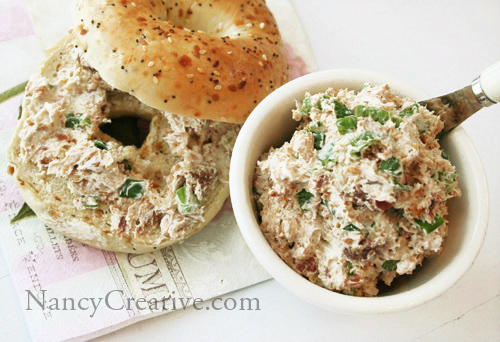 3 of my favorite ingredients placed on top of a bagel. Yes please! It was the first time I had made a bacon spread, too! It’s also yummy if you pop it in the microwave for about 10 sec. after spreading it on the bagel to warm it up a little. this looks like tuna salad! sounds good tho, gonna try it! Does this really call for 4 oz of COOKED bacon? Not 4 oz of uncooked? It seems like a lot. Or is there supposed to be a ton of bacon? Yes, it is cooked bacon–just add less, though, if you don’t want that much in your spread! Why is this only good for 2 days? You could keep the spread longer than 2 days, but I think it tastes best within a few days of making it!